"SPACE SHARKS!" – Epik Fails of History! Yes, that’s right: Sharks IN Space. “SPACE SHARKS!” – a short film by Erik Slader from Erik Slader on Vimeo. First off I’d like to apologize for the unexpected hiatus on ‘Epik Fails of History’ (although to be fair I kind of have a good excuse) and secondly I want to thank each and every one of you for your continued support. 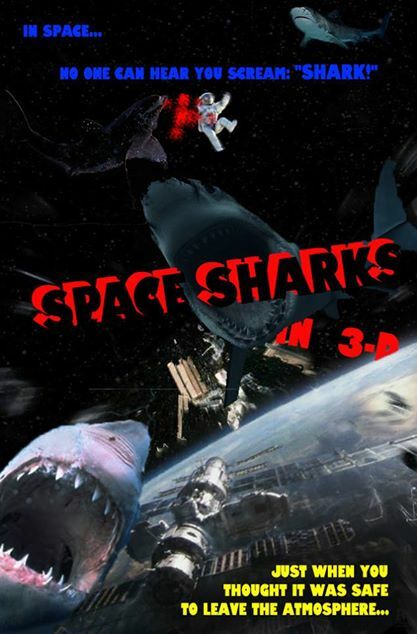 Oh yeah, you’re probably wondering why I randomly made a movie… about sharks… in space! Well, it all started as a joke. Seeing as this was a huge oversight, I decided to do something about it. I just so happened to be taken a video production class over the summer towards my Digital Media Bachelor’s Degree at FSCJ (in Jacksonville, Florida) and realized it was a perfect idea to do something ridiculously hilarious AND learn a thing or two about basic visual effects along the way. It might not seem like much, but this low-budget production was quite the undertaking. I wrote out a short script, about three pages, consisting of everything from super cheesy dialogue and narration to camera directions and titles. Next I created a very simple (and hilarious) storyboard sequence. I then conned a few friends of mine to be in this self-mocking crap fest, who I can’t thank enough for making it all come together: James Lester (Astronaut #1), Shawn Morse (Astronaut #2 aka – the one who loses his arm), Justin Ache (the Scientist / producer), and my wife, Danielle Slader (the Reporter), with a brief cameo and voice over by Chris Carroll, and a brilliant narration by the Pretend Radio podcast’s host: Devin Clark. After filming everything in one day, I began to cut the audio and video clips together. Most of the work (the last two months) were actually spent in post-production. Mixing the sound, assembling sound effects together, editing the footage, and then of course putting the visual effects together. Almost every shot had either matting, roto-scoping, layering sequences, photo-shopped backdrops, or a combination of all of the above. I took still shots of the ISS and the moon from NASA and manipulated them as ‘sets’. I used a few clips and music cues from a few popular sci-fi movies (and the Jaws theme), interspersed with keyed footage of sharks from Shark Week, layered over shots of space. The hardest sequence to create was actually the titles at the very end. I created them in a 3D modeling program called Maya. Because of the glow effect and the teeth chomping down on them, it took quite a bit to render it correctly. Most of the piece was assembled in Adobe After Effects. Random Trivia: Sharks don’t roar. Also there’s no sound in space, because there’s no air for the sound waves to travel through. That said, there’s also not any sharks in outer space (as far as we know). However, in the motion picture ‘classic’, “Jaws: The Revenge” (1987), the shark roars at the end, which I find absurdly funny, so I decided to poke fun at it. I actually created my own sound effects for the Space Sharks by taking audio clips of a Grizzly, mixing that with the sound of a Lion’s roar, and then ran it through some filters in Audacity and added an echo, giving it an appropriate otherworldly feel. In case you were wondering, I got an A. If this thing goes viral, I’ll probably start a Kickstarter for a feature length one. In the meantime, it’s back to work! In other news: I got not just one, but TWO grants for this Fall semester! I’m taking FIVE classes in addition to work and the occasional comic book review for SuperHero Beach. I’ve got several new essays under construction: King John vs the Magna Carta, The Fall of Constantinople, and the Cuban Missile Crisis to name a few – coming in the following weeks. Stay Tuned! These historical figures aren’t going to make fun of themselves! That was hilarious! It would be the perfect sequel to Sharknado…(btw, the reviews in the end: ‘Not bad’ by Michael Bay was one of the best jokes ever…It’s probably what he could have said!